A common question friends and reader ask me is what prompted me to write about the 16th century Venetian ghetto? I am not an historian, in fact until I started the book, had not been much interested in history. I was flummoxed about how to respond to this question until two weeks ago I attended a writers’ conference in San Miguel Allende, Mexico where Barbara Kingsolver delivered the keynote address. She has some interesting things to say about the creative process and writing a novel. She likened it to the growth of a forest.Onto the bare ground, she said, drop a variety of acorns, pine cones and maple seedlings. Some are carried away in a stream, some are eaten by wild pigs, some never sprout, some grow into saplings, and some into mature trees. In the beginning, writing a novel is a act of hunting and gathering- unpredictable, precarious, and amorphous. And so it was with The Midwife of Venice. I was touring Venice with my husband. We were on a walking tour of the Jewish ghetto, which if you haven’t seen it for yourself, is a movie set of narrow, dark buildings and several synagogues, tucked away on second and third floors, out of view (as the law then dictated) of Christian eyes. Walking up the dark staircases and through the musty, dark passages and narrow streets strung with drying wash, I began to wonder how life must have been for the Jews who flocked to the ghetto as one of the few safe havens available at the time. From northern Europe, and then, after 1492 and the expulsion from the Iberian Peninsula, more and more Jews crowded onto this tiny island, chosen by the city fathers as a place to sequester Jews, because it was one of the few in Venice without a church. Naturally, my thoughts turned to the people of the ghetto. I started to read all I could find on the subject of daily life in the ghetto. There is precious little. And precious little about the daily lives of women in particular and how they gave birth. Much of the history of women is written in water. Their accomplishments disappear as smoothly as a stone thrown in a pond. The creations of women are transitory- meals cooked, clothes mended, clothes washed, clothes sold- for one of the few professions Jews were permitted at the time was trade in second hand clothing- children born, children birthed, and children raised. And so in imaging daily life, the image of Shabbat dinner and beet soup came to me and with it the image of silver spoons and a young, shy and unassuming midwife seizing upon the idea of forceps to assist her in her profession. She commissions a silversmith forge her ‘birthing spoons’ as she calls them and practices their use by extracting eggs from the cavities of chickens. Forceps were not in common usage until relatively recently. An English gynaecologist in the 1700’s named Chamberlen invented them and kept them a secret for two hundred years. His family grew rich as a result of the invention. This is not to say that other forceps and birthing aids were not used by individual doctors and midwives over the years. It was a widespread practice, in an age before the easy availability of tools for tradesmen to fabricate specific tools to assist them in their professions. I have my friend, Rhoda Friedrichs, an historian of early modern history, to thank for this bit of reassurance. Hannah’s ‘birthing spoons’ are an outgrowth of this artisanal adaptation to practical necessity and a testament to the creativity, genius and resourcefulness of ordinary people to make their jobs easier and working more effectively. As a result, Hannah’s reputation grows. One night two strangers appear at her doorstep and asking her to break the law and risk her life by delivering a child. In the course of the remainder of our trip to Venice we visited a number of places that triggered further scenes in the novel- the Palazzo ca’d’ Oro, Fondamenta dells Sensa, a pretty house in small square in Cannaregio, which I visualized as the character, Jessica’s house where Hannah hides until her ship sails for Malta. I have included many of photos of this trip, as well as a subsequent trip, to explain illustrate various scenes in the novel. In the Jewish Museum are a number of beautiful silver shadai, amulets to protect against the angel of death. these charms gave birth to the notion of Hannah using her Jewish shadai to protect the Christina child she delivers. 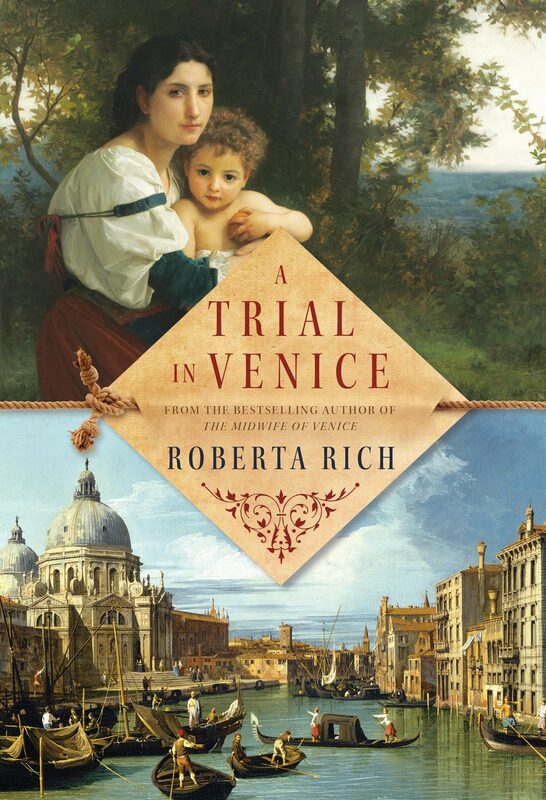 Is The Midwife of Venice a ‘true story’? Is Hannah Levy based on an actual figure in history? I researched long and hard trying to find some evidence for her life in books of Jewish history, and ghetto history. Alas, although I was not unsuccessful, I believe Hannah or someone very much like her, existed. So this is how, for me, a novel starts, a seed here, a sapling here, and after a long time and much fussing and watering and worrying, and weeding, enough trees take root to grow into a forest.